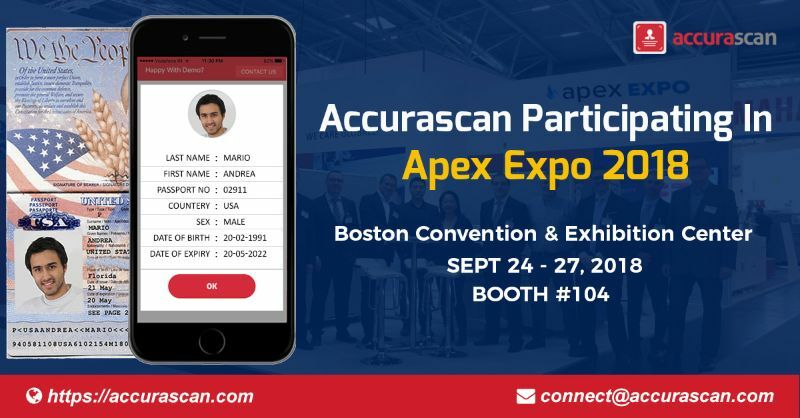 Accurascan is participating in the Apex Expo with an aim to showcase its Passport and ID Card OCR scanning solution at the Boston Convention and Exhibition Center, USA. Accurascan, a leading R&D company today announced its participation in the upcoming Apex Expo at the Boston Convention and Exhibition Center (BCEC) at booth #104 from September 24 - 27, 2018. According to company CEO - Mr Yasin Patel, “We are participating in the event to offer our incredible Passport & ID Card OCR scanning solution for faster web and mobile check-in for airlines.” Highly useful for Border Security, faster Immigration Process and enhancing Customers Experience. Organized by the Airline Passenger Experience Association, the event is likely to attract thousands of industry professionals and companies from all over the world and will prove to be a brilliant platform for the company to create business opportunities too. The skilled developers and designers of Accura Technolabs have developed a robust OCR scanning engine that runs on mobile devices and web platform. Offering Android, iOS, Web SDK & API to customize or integrate the same with any existing application to further extend its potential in facilitating fast scanning of Passport and ID cards for KYC, Quick User On boarding, Web & Mobile Check-in. The company is also offering a Web API (application program interface) to meet the scanning needs of various industry verticals in an inexpensive way. Accura Scan is an R&D company focusing on Computer Vision Technology for Real-Time and Accurate Text Recognition. To know more about its various products, visit https://accurascan.com/.